The Southern Rhne is a wonderful region to explore for value-priced wines, so we assembled a set of Gigondas, mostly from the 2001 vintage. The 2001 vintage has been getting some good attention lately. It's another in a string of good vintages. The growing season was long and relatively problem-free, with growers in the Southern Rhne starting to pick around the third week of September. The weather even warmed up in October, allowing the remaining, un-picked vineyards to achieve a nice level of ripeness. The question of "maturity," though, is one not solely based upon sugar levels. Those who picked based upon sugar may have harvested fruit with "green" elements, while those who paid close attention found the real maturity in the fruit arriving a bit after the desired sugar levels were achieved. Yields in most vineyards were down. Syrah was reportedly off by about 20%, with Grenache producing as little as half its normal yield in some cases. 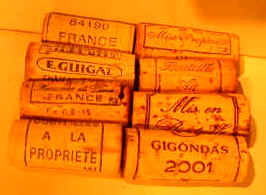 As these wines are, for the most part, the work of "old world" vintners, oak is not a major part of Gigondas wines. 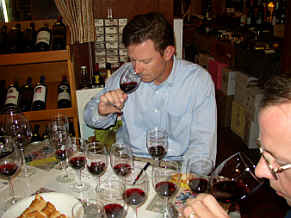 As a result, the tasters had to really examine the wines through-and-through to see what "makes them tick." The point spread from top to bottom was much less than in many of our tastings. Notes compiled by Gerald with Robert Gorman adding his two cents' worth. Though designated as an old vines bottling, this wine was one of the lighter and simpler wines of the tasting. It was flawed only by its lack of intensity. One taster characterized it as "jug wine." Another found "weedy, herbal notes suggesting unripe fruit and it's soft on the palate and thin, as well." Less enticing sounding were the words of another critic who encountered "sour cherry fruit with a whiff of acetone, along with some mouth-coating peppermint essence." A visiting winemaker with experience in traveling the wine roads of the Rh�ne Valley found notes of "gum leaf and a nice texture here. It's a pretty wine with obviously ripe fruit." But a final critic dismissed this as "not distinctive and rather light." Bob said "This wine has a candy-like edge to the fruit and some leesy notes; it has nice Rhne character but fails to develop in the glass. On the palate the wine has a soft, ripe Grenache character; it's tasty as a C�tes-du-Rh�ne , but only so-so as Gigondas. Gerald faulted this wine for having more "structure than it needs, given the tannin level. The wine has a nice hint of plummy fruit on the nose with a kirsch-like note to the fruit...certainly a bit warm. It's a bit tannic and harsh given the lack of really concentrated fruit on the palate. Still, worth a half-star rating on my three star scale, no stars being ordinary and three being tops." This wine did not elicit any positive commentary from the crowd. One taster felt this displayed "Brettanomyces" aromas, while another interpreted the nose as having hydrogen sulfide smells. Another person said it reminded him of "manure," while someone else felt the nose here was "reduced." Another described it as having a "shellac-like fragrance with questionable fruit." 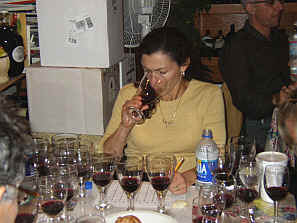 Someone else detected "stinky notes with burnt rubber, fig-like fruit and very bitter tannins." Still, another taster found this "rounder than most with a touch of vanilla. It's not especially complex or distinctive." Bob described this as a "Big wine; it has a slight H2S component (hydrogen sulfide/rubber tire); there's curious spice and sulfur; something else! It's one big meaty wine on the palate but the sulfur terroir dominates a bit too much." Gerald found "ripe berry fruit with a hint of earthiness. It's got a warm, stewed fruit quality with a mildly resinous character. On the palate, though, this is a bit coarse and astringent with some earthy and leathery flavors. It's a nice 'cowboy' Rhne. One-and-a-half stars." 6th Place: 2S component (hydrogen sulfide/rubber tire); there's curious spice and sulfur; something else! It's one big meaty wine on the palate but the sulfur terroir dominates a bit too much." Gerald found "ripe berry fruit with a hint of earthiness. It's got a warm, stewed fruit quality with a mildly resinous character. On the palate, though, this is a bit coarse and astringent with some earthy and leathery flavors. It's a nice 'cowboy' Rh�ne. One-and-a-half stars." One critic found a "strange cherry fruit with a hint of vanilla and a strong anise note on the finish." Another taster detected "ripe and jammy fruit with blackcurrants, warm vanilla some blueberry cobbler aromas and challengingly gritty tannins." Someone else felt it's a "typical Grenache-based blend." Another panel member found this wine "changed the most over the course of the tasting. It's got spicy notes with good peppery tones and some rocky, minerally notes." One taster with the title "winemaker" on his rsum, told us this wine was made, "at least in part, with a carbonic maceration fermentation and it has a stalky quality on the nose." Bob found "A slight musty note blows off; there's wet leather (Brettanomyces); Rhone/Gigondas fruit comes through. A tough wine! The fruit almost warrants all that tannin." Gerald found the fruit here to be highlighted, so perhaps the notion of some whole berry fermentation is correct. "The wine features lots of berryish fruit with a hint of a woodsy note and some vanillin fragrances. There's ample fruit on the palate, with some rather aggressive tannins. This creates a bit of an imbalance, as the wine seems somewhat charming on one level, yet bitter on another. One star." Our lone 2000 vintage wine in the tasting, we included this since Guigal is one of the most important winemakers in the Rh�ne. One critic said "It doesn't have much of a nose, but is medium-bodied and has some strong pepper flavors and is well made. It's a bit thin and rather straightforward." 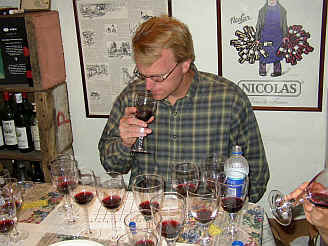 Another person found "earthy, slightly metallic notes with some black olives. Then there's a dank note with gritty tannins and a tart quality. Bitter on the finish." Someone else found "ripe, red fruit notes, but it's kind of dull, thin and herbaceous. A narrow, simple wine without much stuffing." Another critic encountered a fair bit of wood, saying "this has oak all over it!" Bob wrote "Here's straightforward Syrah/Grenache Rhone but Gigondas terroir comes up and keeps coming; nice! There's a slight trace of rubber tire. There are herbal/spicy notes on the palate with nice length but the fruit lacks a center." Gerald found "lots of sweet raspberry aromas to this wine with plenty of fruit and it's easy to like the engaging aromas. I found it soft and supple on the palate with some berry-like flavors all the way through. One star." One person characterized this as having a "breakfast nose," since it displays "bacon fat aromas and eggs over easy, but it's overly tannic." Another panel member found "luscious herbal notes which are so typical of the wines from this area. There's a touch of banana with nice, gamey notes and a good level of tannin." Someone else described this as "charming, but not having the depth of the better wines of the tasting." Another critic liked its "showy nose, being the most fragrant but it petered out on the palate." Other descriptors include "floral," "nicely balanced," and "strawberry jam with slightly medicinal minty notes." Bob found "There are hints of cola nut and naphtha with nice bright Syrah/Grenache fruit and a stony terroir; a generous; "racy" wine. A stunningly delicious mouthful; there is some heat and a bitter edge to tannins; the wine is long, tough but splendid!" Gerald detected a rather resinous character here, which "gave way to more lightly spicy aromas and a hint of a tea-like fragrance. There are some brown spice aromas, too, but I marked this down on the palate. It's got a fair bit of heat and some mouth-drying tannins. The fruit is pleasant, but the tannic finish makes this less charming. One star." A fellow sitting in Singleton's usual place encountered "pepper notes and briar with Madagascar cocoa nuances. Chalky tannins and pepper all the way through with a sweet character at the end." 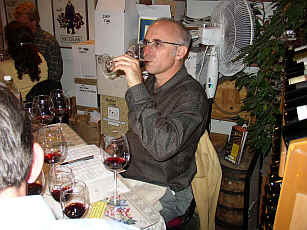 Another tasting participant found "white pepper and spice notes" here. A third person found this to be "simple and ripe, but it has volatile acidity which is bothersome." Another taster knocked this for having an "alcoholic nose." A fifth critic enjoyed the "best spice and pepper on the nose, but it also has an aldehydic quality which I did not like." Bob found "Sweet oak and spice and an earthy Gigondas character; there's cola and that classic stones and rocks terroir. Grenache seems to predominate; it's nicely ripe with a slight strawberry jam note." Gerald found "lots of bright raspberry fruit with a sweet note. The same elements shine brightly on the palate, with lots of berry fruit and an offsetting and balancing level of tannin. Two stars." One participant found sweet spicy notes with a hint of manure pungency but some coffee overtones. It's balanced with tart berry notes and some fennel. It definitely needs food!" Another person detected "Hydrogen sulfide at first but this went away after some airing." Someone else said "this doesn't seem typical of Gigondas as it's rather more Bordeaux-like being somewhat elegant." Another taster described it as "low in total acidity, high in alcohol and it has suspect structure for cellaring." Bob encountered "Stunning strawberry/raspberry/cherry notes on the nose (from Grenache/Syrah), terroir (wet stones); some wet leather notes develop in the glass; a bit Pinot-like! Refreshing "tonic-like" entry with nice concentration following through. " 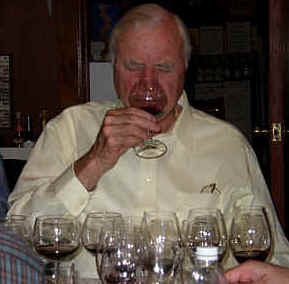 Gerald felt the earthy, leathery aromas were typical of intense southern Rhne wines. "There's also a hint of a pine or resin aroma and the wine is a bit woodsy. The structure is good, having mild tannins and good fruit. The flavors linger nicely on the palate. Two stars+." One person joked "This is a violent wine, for it really attacks the palate." Another person found it to be "coarse and alcoholic, with mint, spearmint notes along with some rhubarb and cherry. It's also a bit hot." A third critic liked its "good nose," while someone else said "this has really deep color and good structure as well as opening up nicely in the glass over the course of the tasting." Another found it to have a "ripe and oaky nose with good intensity and wonderful depth. It's the most substantial wine of the tasting." A final critic knocked it for being "hot and bitter." Bob said "There are deep strawberry/raspberry notes and even some "chocolate covered cherries"; typical Gigondas. Here's a balanced, rugged, earthy, delicious wine; tough but what a mouthful!" 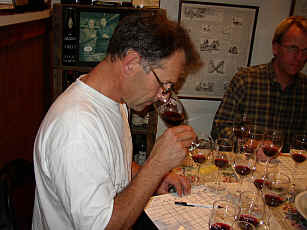 Gerald described the nose as "warm and mildly spicy with an earthy note and some brown spice fragrances. There's also a hint of pencil shavings to the nose. It's nicely tannic with good, offsetting fruit so it may be worth cellaring for a few years. Very good wine. Two stars+.